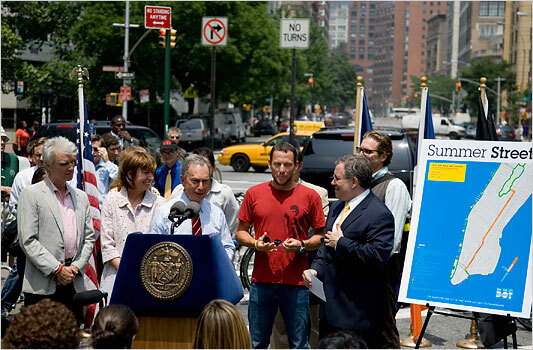 Browse: Home /	Bicycling, Transportation / “Summer Streets” for NYC! Yes, that’s David Byrne and Lance Armstrong bringing some celebrity power to the proceedings. The dates are August 9th, 16th and 23rd — can’t wait! For an idea of how fun this will be, check out the Bogota’s Ciclovia on Streetfilms. Next… BROOKLYN Summer Streets!! WOW!!! I’m there!!! :)))) so fun!!!! Solar Summit 2007: Power, Policy, and a free (NOT Plastic) Bag!